CHICAGO (AdAge.com) — He’s been called the world’s worst dog, but Purina couldn’t say no to Marley. 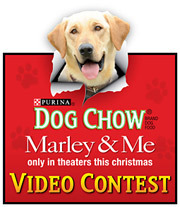 ‘Marley & Me,’ which hits theaters Christmas Day, is Purina’s first major branded-entertainment play. Purina has, of course, been selling dog food for eons, and has passed on many canine-featuring flicks. 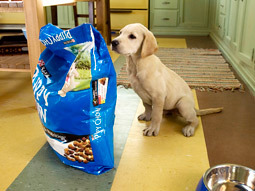 But “Marley & Me,” the film from 20th Century Fox starring Jennifer Aniston and Owen Wilson, has inspired the pet-food marketer to dig into its first major branded-entertainment play. The company’s director of marketing, Pat Mullen, said the “known quantity” of working with a best-selling book, an A-list cast and an accomplished director (David Frankel, who directed “The Devils Wears Prada” and has numerous TV credits) made this project too good to pass up. The deal goes well beyond product placement and includes integrations in nearly every communication for the brands. The deal includes integrations in nearly every communication for the brands, including a contest in which consumers can get videos of their own rascally dogs included on the ‘Marley & Me’ DVD, which comes out this spring. The deal also includes a number of contests and giveaways — including a Willy Wonka-esque “Golden Bone” giveaway of tickets to the Hollywood premiere — and major retail displays, such as a contest in which consumers can get their videos of their own rascally dogs included on the DVD, which comes out this spring. Finalist videos got an airing earlier this year in co-branded TV spots during the National Dog Show. Other aspects of the campaign include Chow-branded Marley calendars and holiday ornaments, created by agencies Checkmark and William Morris and Fallon. The consumer-generated-video finalists can be found on longliveyourdog.com. The film will hit theaters Christmas Day.